Ask any Indonesian here in Jakarta about Medan and its people, and you will likely get one of several prevailing opinions. Some declare it a rough and aggressive place whose unruly residents speak with a coarse accent. Others rave about the food, particularly the non-Muslim fare of the Chinese and indigenous Batak communities. Still others might say the city has a reputation for crime: cue the Medanese friend who spoke of a break-in at his family home while his mother was around – the thief escaped after hearing her screams and realizing he’d entered the window of a room that had been locked from the inside. Then he told me of a cousin’s encounters with a (sympathetic) local mafia boss who was a regular at her restaurant. 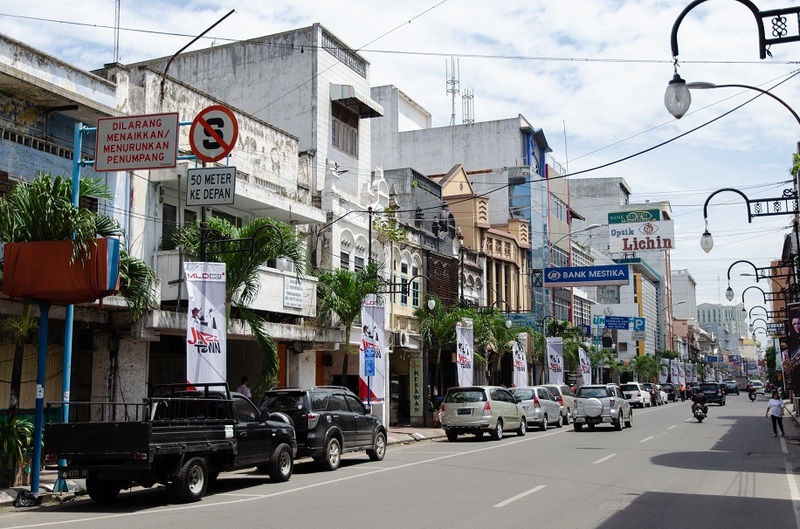 Few visitors – if anyone – would describe Indonesia’s fourth-largest city as beautiful, charming, or easy on the senses. But good food is not the only redeeming quality of the boisterous provincial capital of North Sumatra. 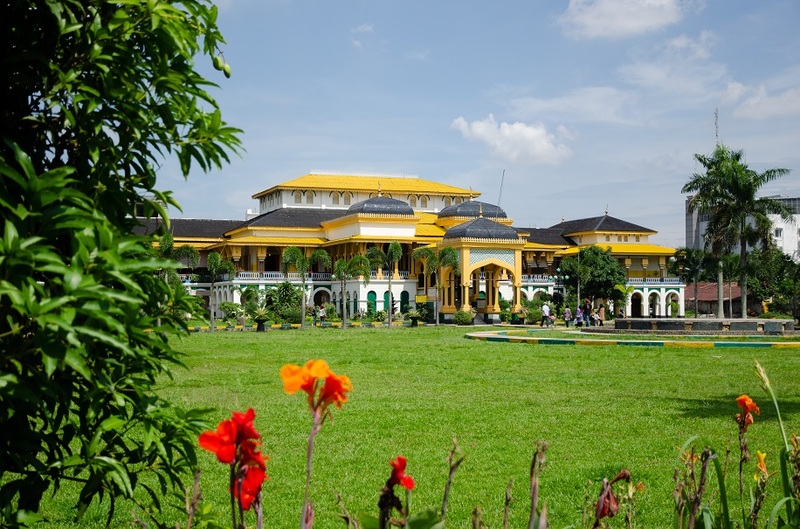 Guidebooks never devote much space to Medan: many Sumatra-bound travelers see it as a place of arrival and departure, a useful transit point en route to the scenic highlands and Batak villages around Lake Toba, or the wilds of Gunung Leuser National Park. I too had this mindset until Bama convinced me to budget two days to explore its historic landmarks and take advantage of Medan’s big city conveniences in the earlier stages of our six-month-long Spice Odyssey. 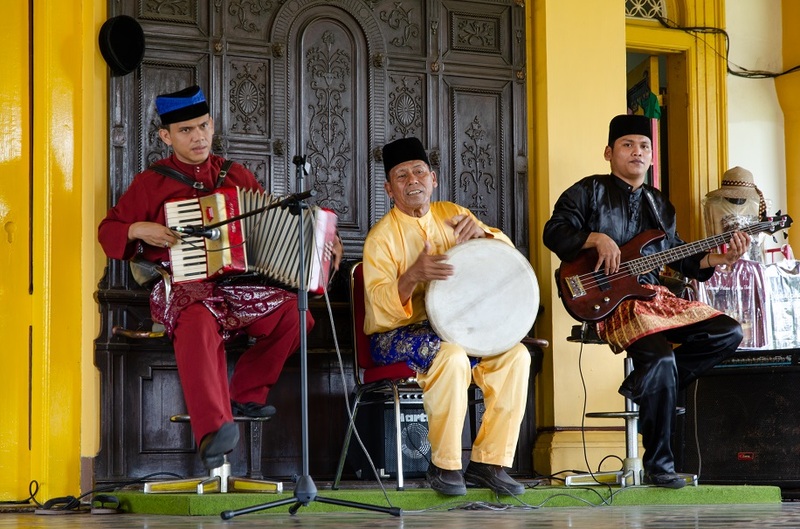 But there was still a measure of culture shock, even if we’d just spent five days in the deeply conservative province of Aceh. 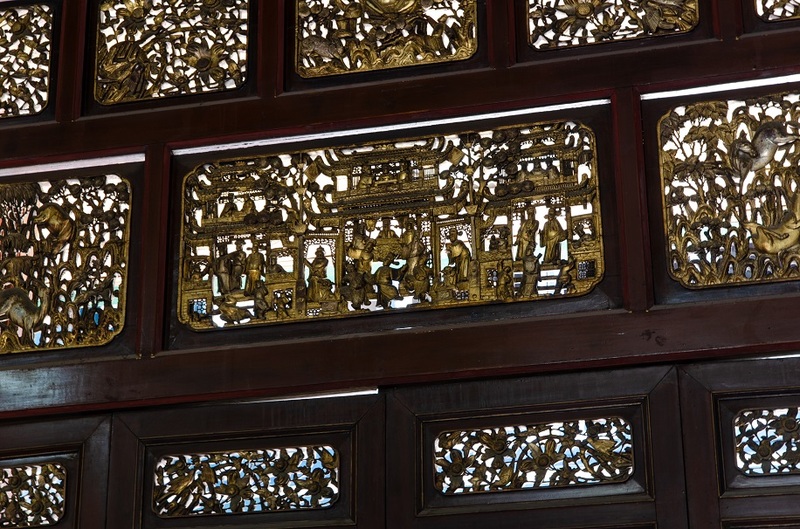 The Medanese penchant for terseness and direct speech came into focus soon after we left the steel-and-glass terminal at Kuala Namu International Airport. A prospective driver tried to pitch his services to Bama, who was cautious, noncommittal, and understandably spare with his words. “Why are you speaking to me like I’m a criminal?” The driver retorted. After some discussion about the price, we did in fact take him up on his offer to drop us at our hotel downtown. Much of the journey was spent traveling along the Belmera Toll Road – a ribbon of asphalt cutting through Medan’s sprawl of concrete and corrugated iron – with a turnoff amid paddy fields flanked by humble brick homes. 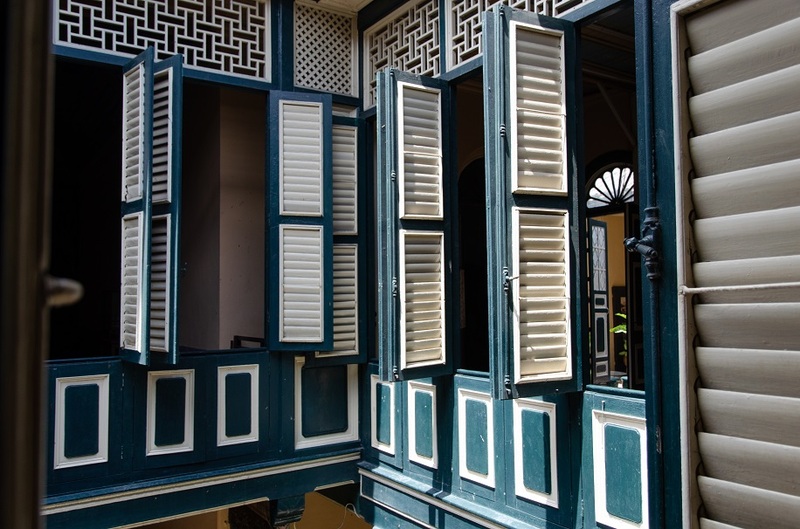 This eventually gave way to row upon row of drab multistory shophouses, often with metal bars and cages over the windows of the upper floors. 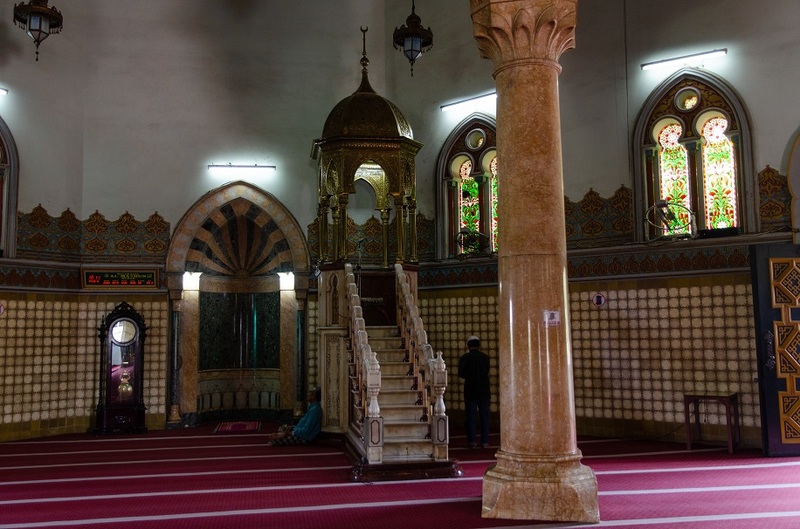 Once we’d checked in and dropped off our backpacks, Bama flagged down a motorized becak (trishaw) and negotiated a ride to Al Mashun Grand Mosque, better known as the Great Mosque of Medan. 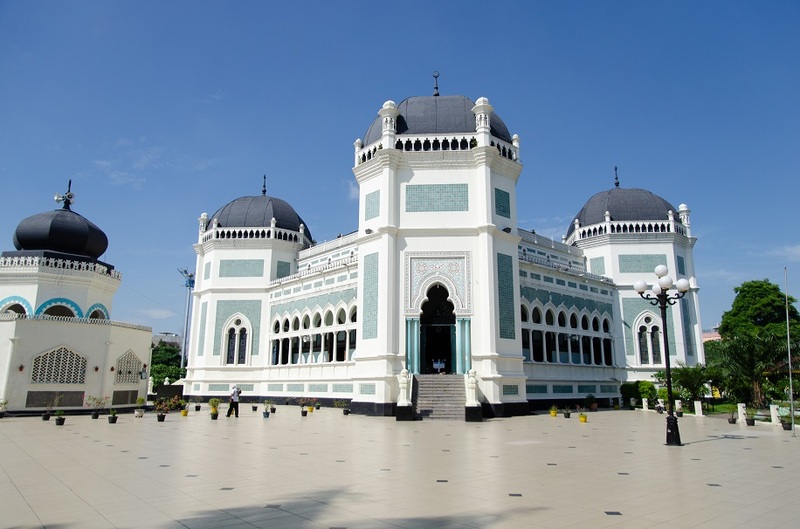 It is easy to see why Medan’s main mosque has been an icon of the city since its completion in 1909. The work of Dutch architect J.A. Tingdeman, it draws inspiration from a wide range of architectural traditions. 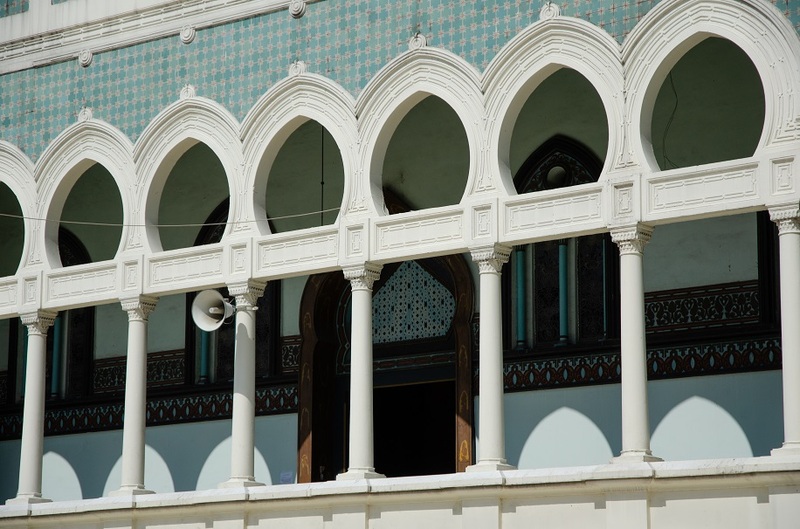 The building has an Ottoman layout with four secondary domes arranged in a square around the bulbous central dome, and is a gorgeous confection of Arabesque ornamentation, Indo-Saracenic finials, banded horseshoe arches recalling the Moorish-built Great Mosque of Córdoba, and Gothic-style double windows with an oculus, suitably filled in with stained glass. 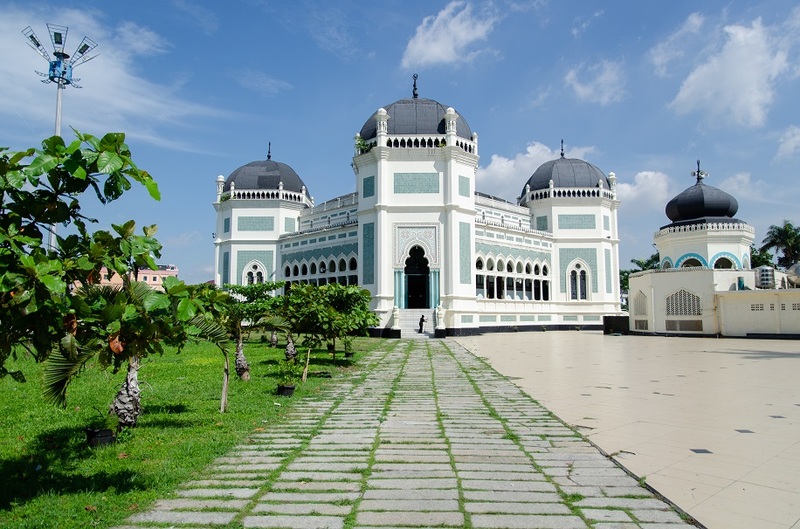 You see, this mosque – and just about every other important building in Medan from that period – was financed by the lucrative trade in locally grown tobacco. From the early 17th century a small Malay kingdom known as the Sultanate of Deli had held sway over the area. Its ninth ruler, Sultan Ma’mun Al Rashid Perkasa Alamyah (reigning from 1873–1924), continued his father’s close relationship with Dutch colonial authorities, who proved useful for their introduction of tobacco and the latest cultivation techniques while guaranteeing Deli’s security in the face of threats from neighboring rival sultanates. Deli soon became one of the most important tobacco producers in the world and a chief source of raw material for high-grade European cigars. The ensuing growth and prosperity transformed the small sultanate into a flourishing mart of trade, so much so that it was nicknamed het land dollar, “the land of the money”. With Medan’s transformation from a village on swampy ground to a burgeoning city, a host of new arrivals came to seek their fortunes. Laborers and budding entrepreneurs flooded in from other parts of the Dutch East Indies (modern-day Indonesia), China, and even southern India. European planters hailed not just from the Netherlands but also countries like Poland and Switzerland, a fact remembered today by the district names Polonia and Helvetia. 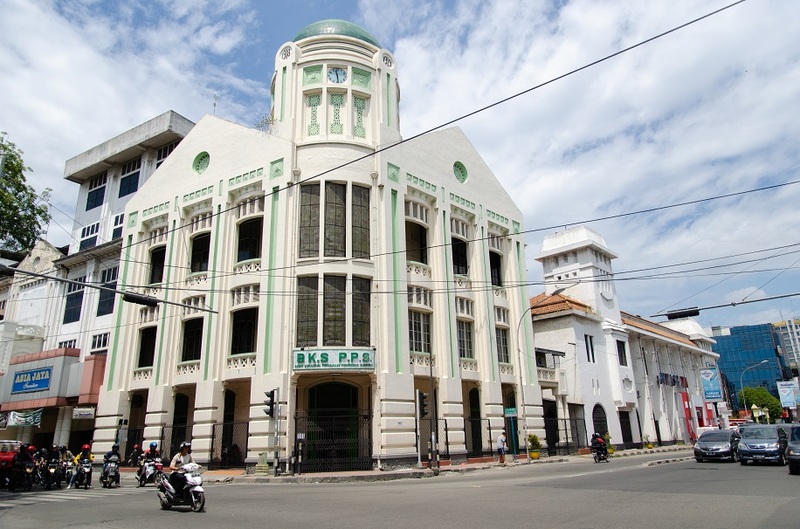 Dutch settlers dubbed the boomtown “Parijs van Sumatra” for its streets lined with handsome European-style buildings, as though the French capital had somehow been transplanted to this sweltering tropical island. 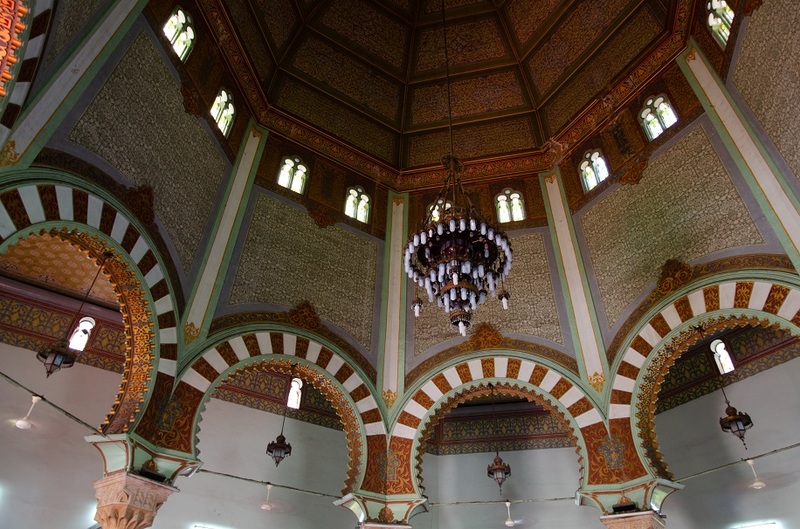 And fin de siècle Paris could not claim to have a mosque as beautiful as that commissioned by Deli’s builder-sultan. 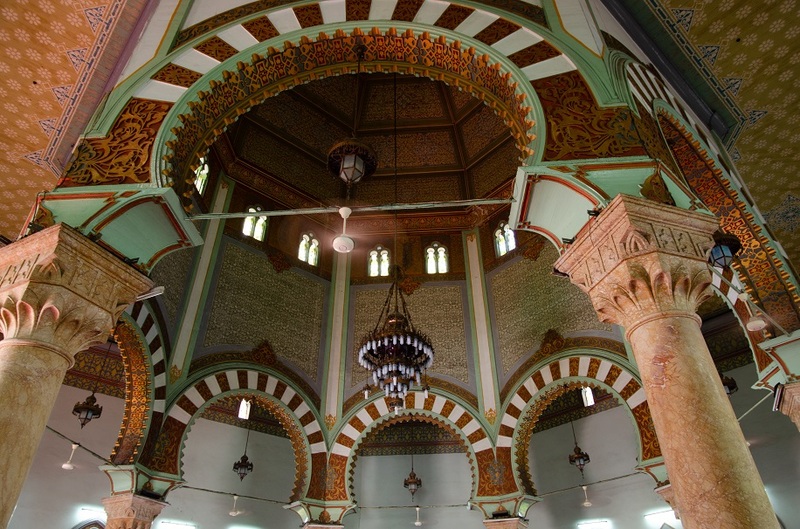 No expense was spared in the construction of the Al Mashun Grand Mosque. 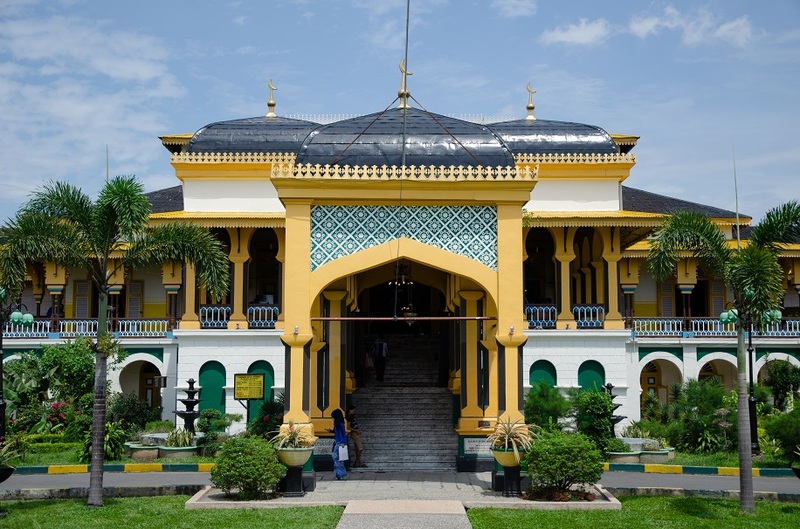 Sultan Ma’mun set aside a budget of one million guilders (or roughly US$10.3 million in today’s terms), and the palace shared the cost with the Dutch-owned Deli Company and Medan’s wealthiest businessman of the time, a Hakka Chinese immigrant by the name of Tjong A Fie. Only the finest materials would be used: Italian marble, Chinese stained glass, and chandeliers shipped via the Suez from France. 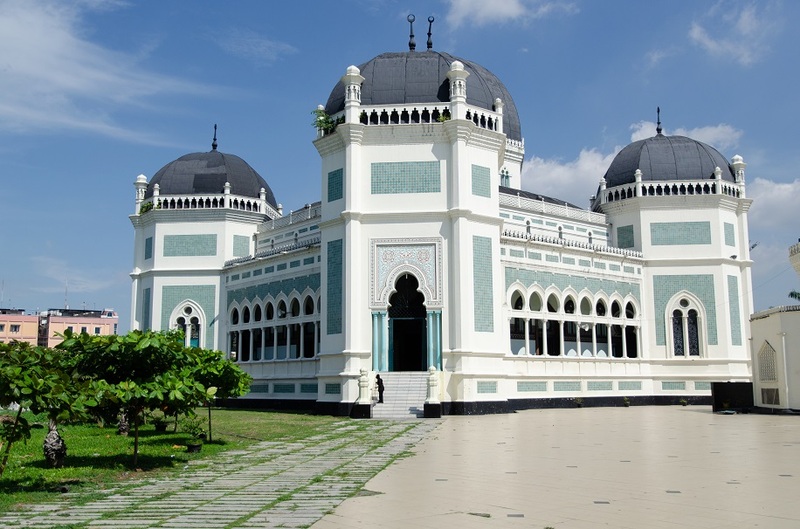 The sultan was determined that this public house of prayer would outshine his own palace, the Istana Maimun, which had taken shape in 1888. 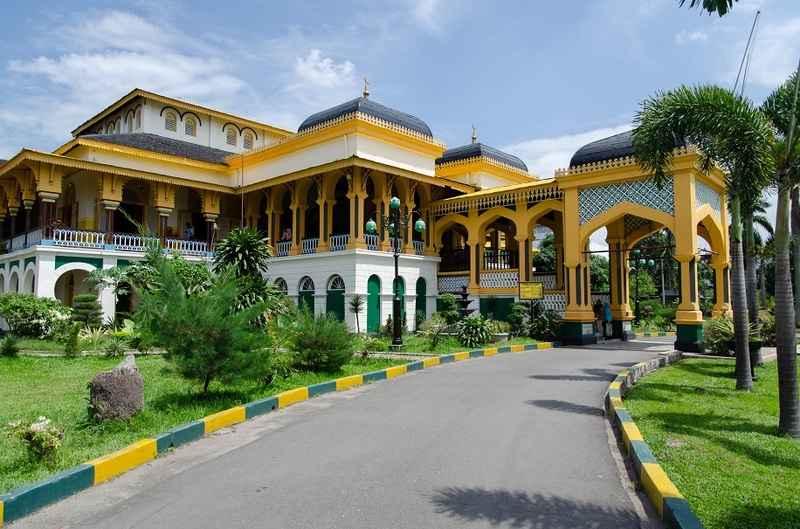 Present-day visitors to Istana Maimun will no doubt notice the abundance of yellow and green; the former denotes royalty and wealth, and green is the color of Islam, which has become an integral part of Malay culture since it was first introduced by Gujarati traders around the 13th century. 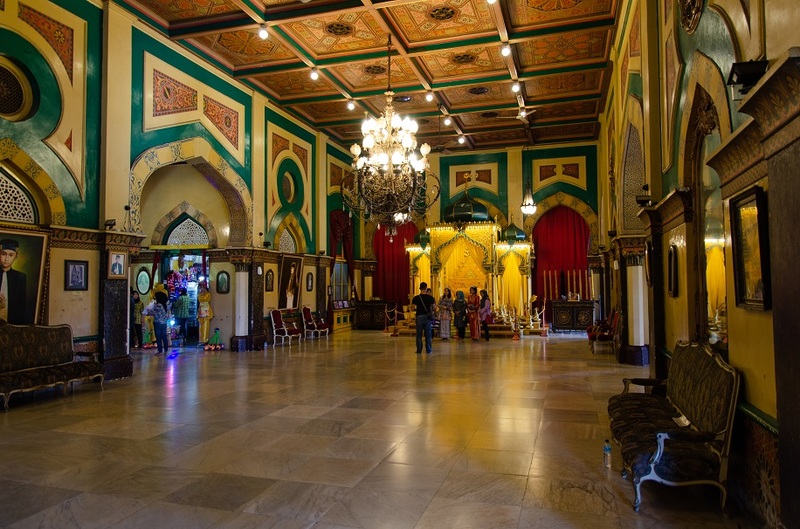 The Deli royal family still resides in a wing of the palace, though its members have shed their political power since the Indonesian struggle for independence in the wake of World War II. 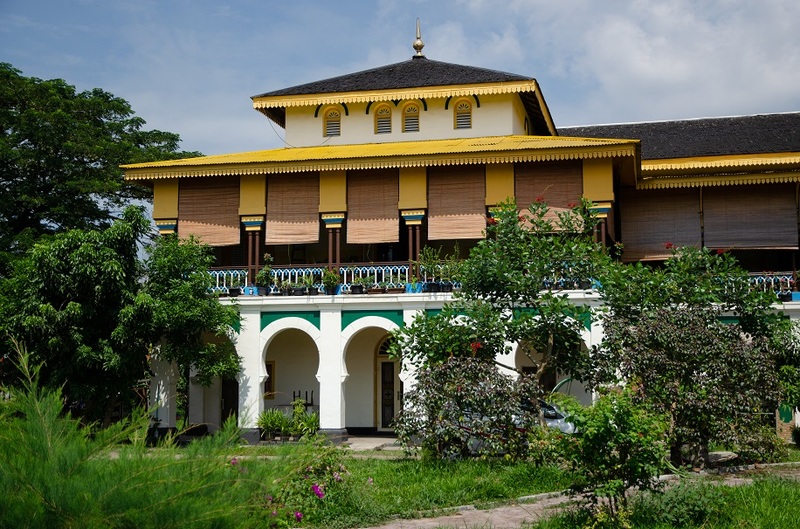 After inspecting the dimly-lit throne hall at Istana Maimun – where it’s possible to don traditional royal attire for a small fee – Bama and I started out on a 20-minute walk to Tip Top Restaurant, a local institution that first opened its doors in 1934. Tip Top lies at the heart of Kesawan, a thriving neighborhood that grew up along its namesake artery (now officially called Jalan Achmad Yani), the oldest street in Medan. 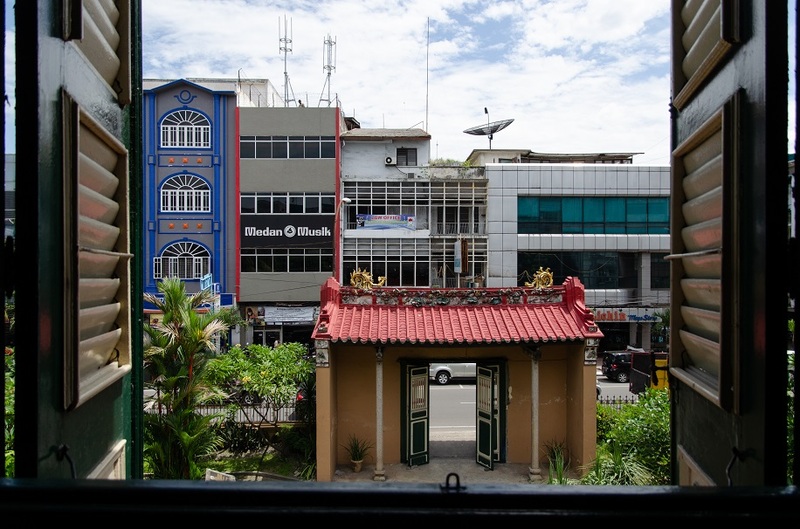 Today’s Kesawan is a hodgepodge of colonial-era shophouses, stately Beaux-Arts and Art Deco office buildings, and modern utilitarian structures. But with its rattan chairs and homey, old-school decor, Tip Top is something of a time capsule – it hasn’t changed much from its heyday during Dutch colonial times as the preferred venue for social events. The menu still features Dutch favorites like bitterballen and uitsmijter, or open-faced sandwiches of fried egg and ox tongue. Bama had brought me here to try the ice cream made using traditional recipes and vintage pre-war machines. 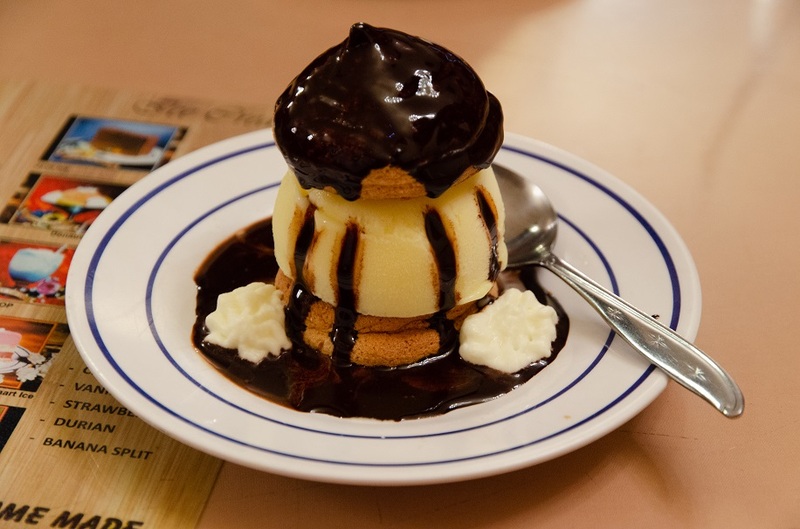 I opted for Moorkop Ice, which describes a generous scoop of vanilla ice cream sandwiched between two airy pastries, and a playful riff on a chocolate-glazed profiterole filled with whipped cream. Another highlight of Kesawan stands less than 100 meters – and just across the street – from Tip Top Restaurant. 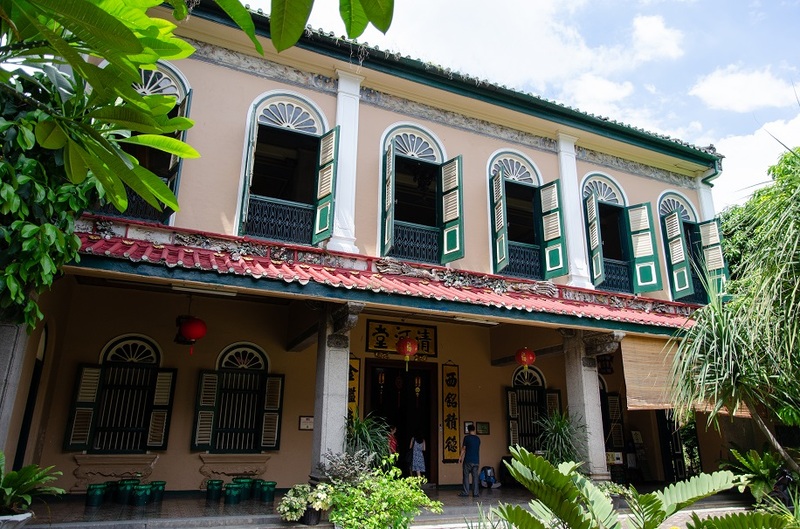 This is none other than the two-story Tjong A Fie Mansion, a onetime residence of the aforementioned tycoon who had it built in 1895 as a gift for his beloved third wife Lim Koei-Yap (Tjong’s second wife had died several years before his marriage to Lim). 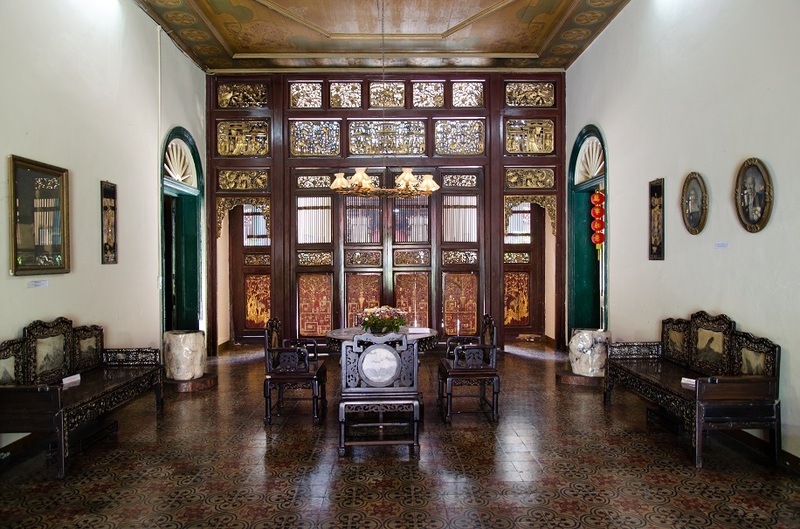 The mansion is said to be based on that of his close relative (purportedly his uncle) Cheong Fatt Tze in Penang, on the far side of the Strait of Malacca. Together the two houses hold the distinction of being the only five-courtyard Chinese mansions outside of China. 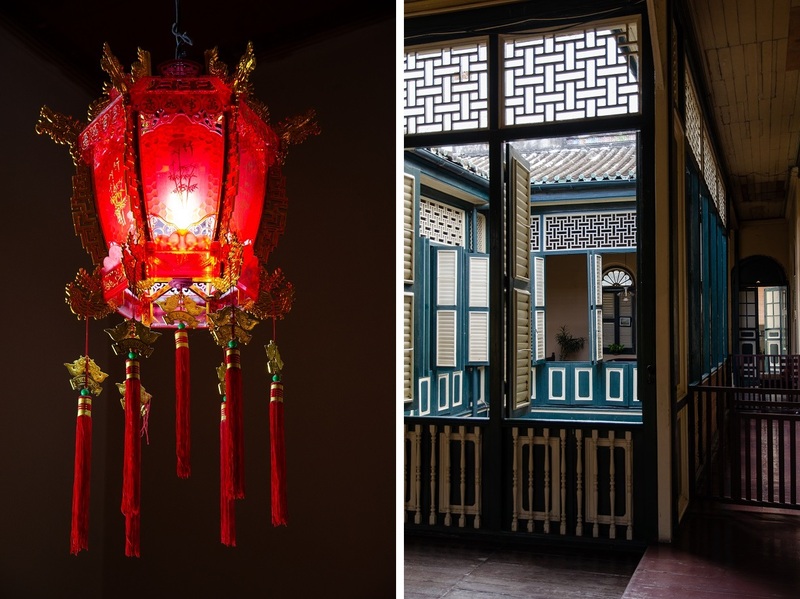 Not unlike its counterpart in Penang, Tjong A Fie Mansion is a tasteful blend of Chinese architecture and European aesthetics, with subtle touches of Art Nouveau in the sinuous wrought iron balustrades and flora-inspired light fixtures. 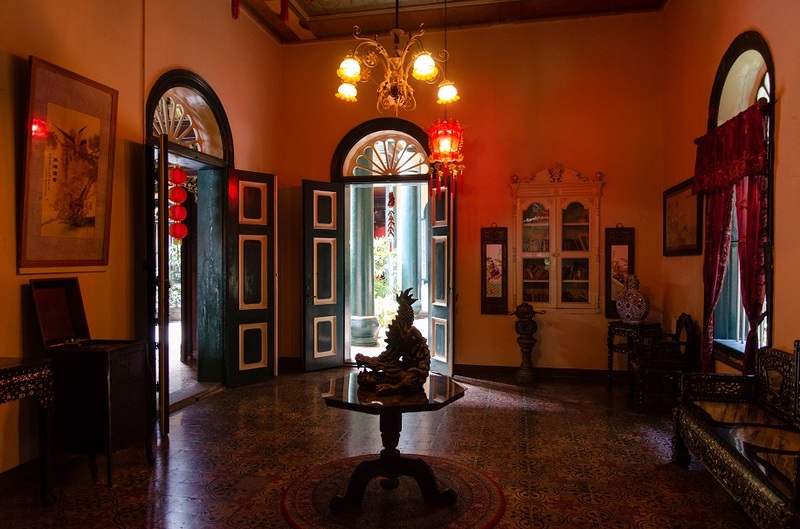 The 35-room mansion is also graced with gilded timber filigree doors, original hand-painted Italian tiles, and shuttered windows that are an intuitive response to Medan’s tropical heat and humidity. Despite its importance and sublime beauty, Bama and I found the mansion surprisingly devoid of visitors. 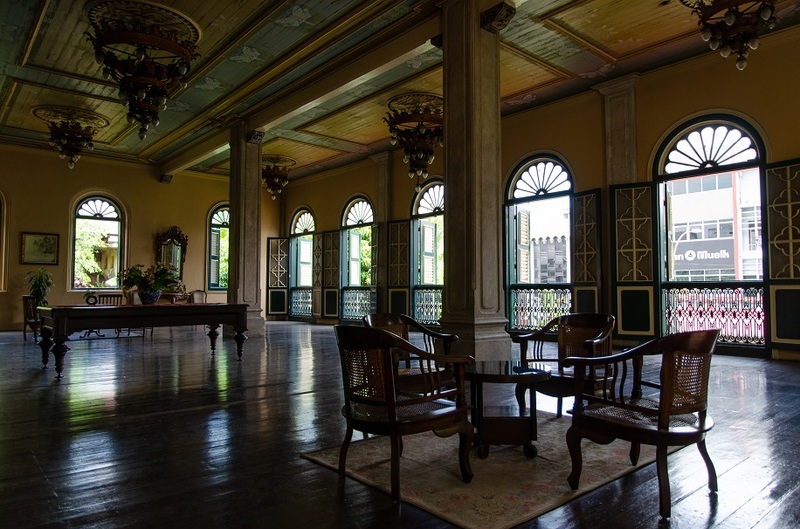 We virtually had the place all to ourselves, and happily spent a good hour ambling from room to room, admiring the intricate woodwork and period furniture that recalled the turn of the 20th century. 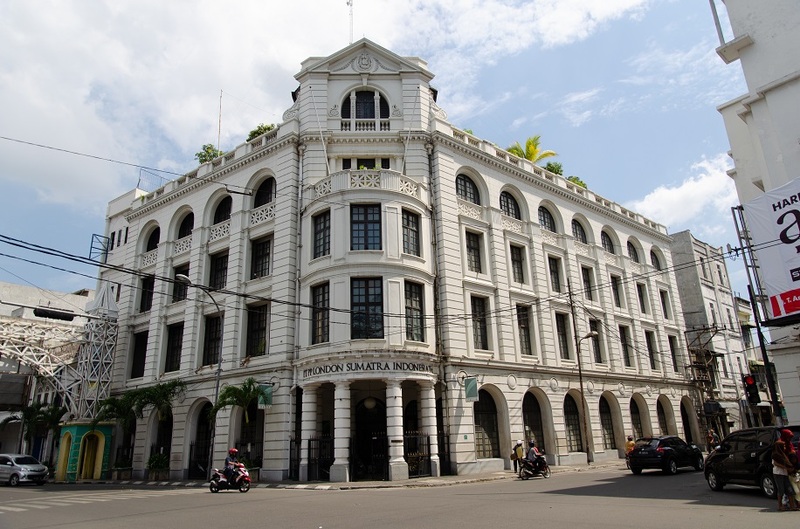 What makes the story of Sumatra’s first millionaire even more compelling is the fact that he did not come from a privileged background. 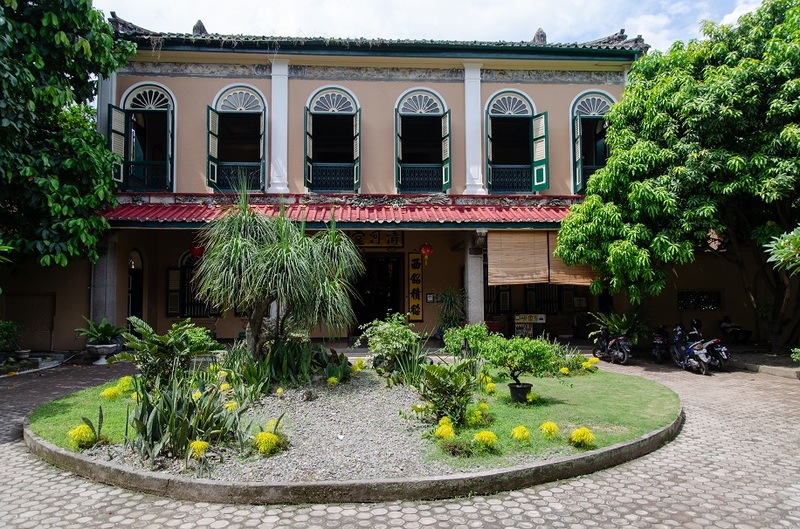 Born in 1860 into an impoverished Hakka family in the southern Chinese province of Guangdong, Tjong A Fie arrived in Medan at the age of 18 to join his elder brother Tjong Yong Hian. Through sheer hard work, determination, and a keen business sense, he became a successful grocer who went on to run a large-scale plantation business, employing more than 10,000 workers harvesting tobacco, palm oil, sugar cane, tea, and coconut. In later life his reach extended to real estate, banks, and railroads, though he never did forget his humble roots. 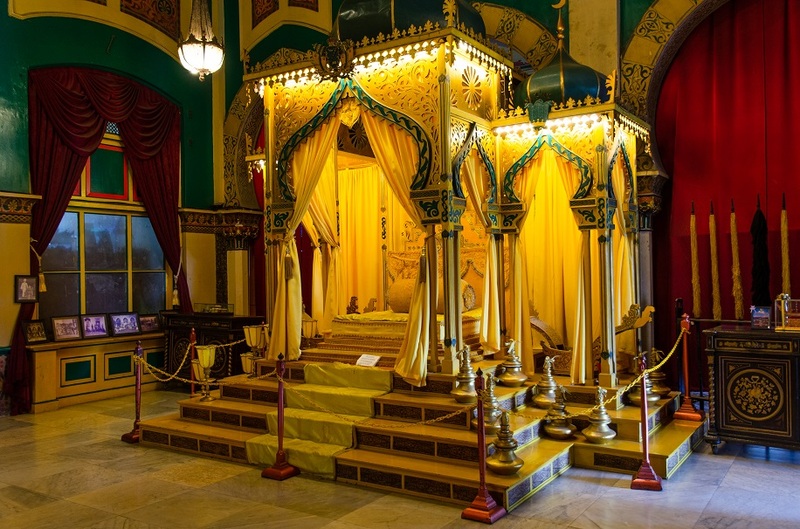 As a philanthropist, Tjong donated a significant percentage of his wealth to worthy causes that catered to the needs of the growing city; he financed the construction of schools and hospitals, alongside mosques, churches, and temples. 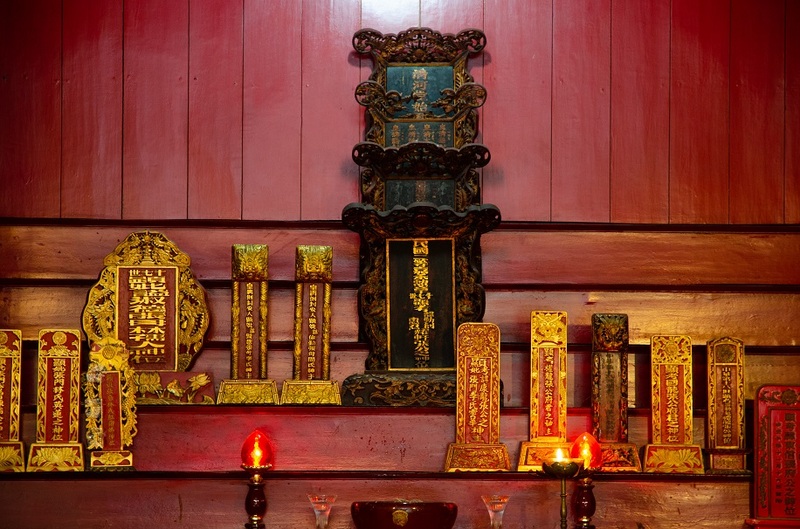 Tjong A Fie was well ahead of his time in that he did not give preferential treatment to any particular racial or religious group. Beautiful place. Thanks for writing about this. My pleasure – thanks in turn for reading and commenting as always! 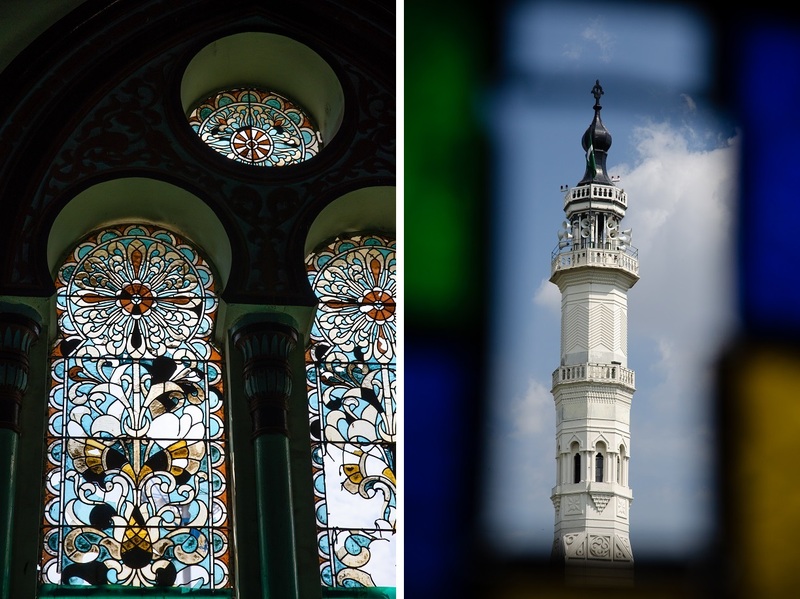 You know how gloomy my photos of the mosque and the palace were from that first trip to Medan back in 2012. So, despite the intense heat, it was a nice day when we were there as the skies were mostly blue. Almost all of the people from Medan who I know here in Jakarta actually admit that they do have a reputation for being rude, although some of them would argue that in spite of looking rough on the surface, they’re actually kind-hearted… or at least that’s what they claim. 🙂 Too bad you didn’t get to try bihun bebek! 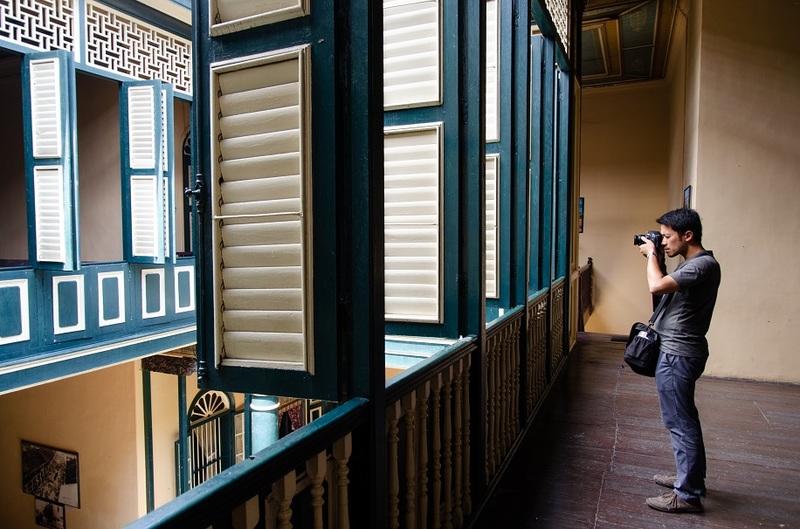 It’s great that you got a second chance with the photos – I’m surprised that you didn’t get to go inside Tjong A Fie Mansion the first time. And I do remember how you raved about the bihun bebek when you returned there for work. 🙂 On our next visit to Medan I guess the focus will be on sampling as much of the local food as we can handle! Sadly I did exactly what you said most of us do: saw Medan as a dirty city to fly out of to KL and missed all the beautiful buildings, especially the amazing mosque. I don’t blame anyone for doing that, Mallee… Medan is really not the most visitor-friendly place, and even more so if you decide to walk and dodge the seriously aggressive drivers (they are worse than the ones we have here in Jakarta)! I appreciate how you have focussed on the redeeming qualities of Medan. The architecture/colours of the buildings you have highlighted are exquisite. 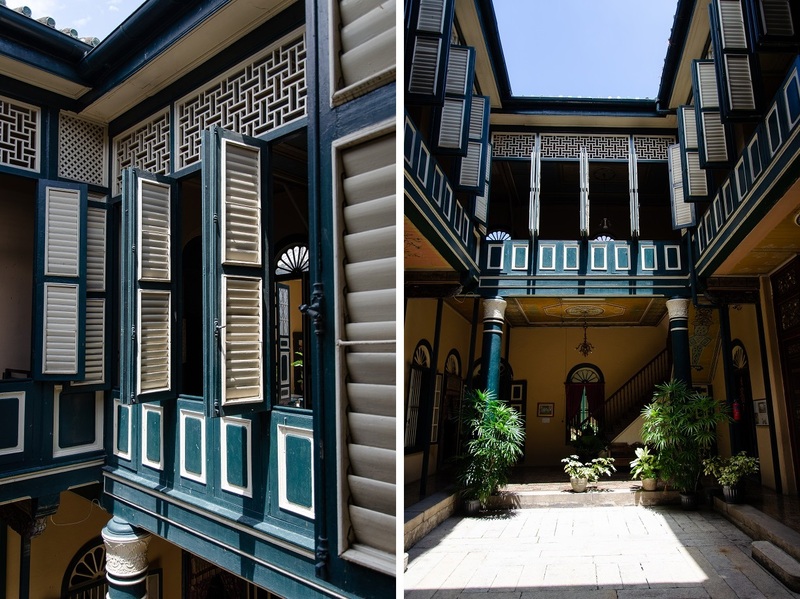 I’m with you on being awed by the teal and white palette of Tjong A Fie Mansion. 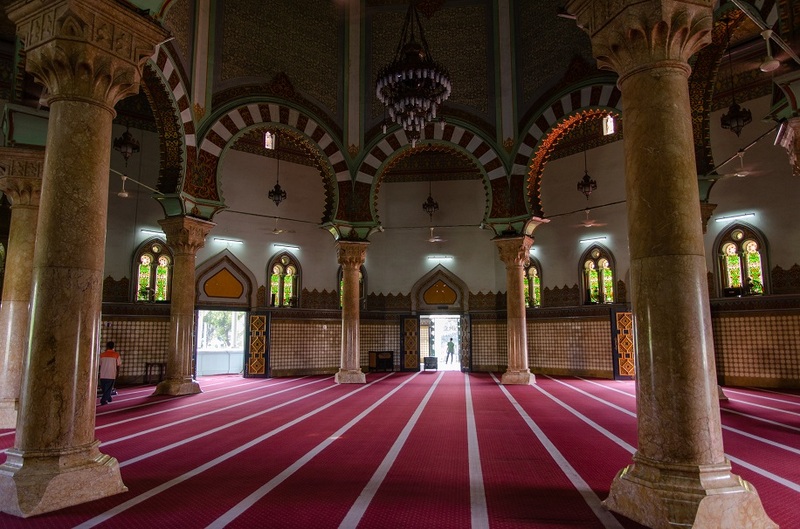 It’s great that you were allowed to visit the Grand Mosque. (Very cool to see your photo of the banded arches design that I found so fascinating when I visited the Grand Mosque of Cordoba.) 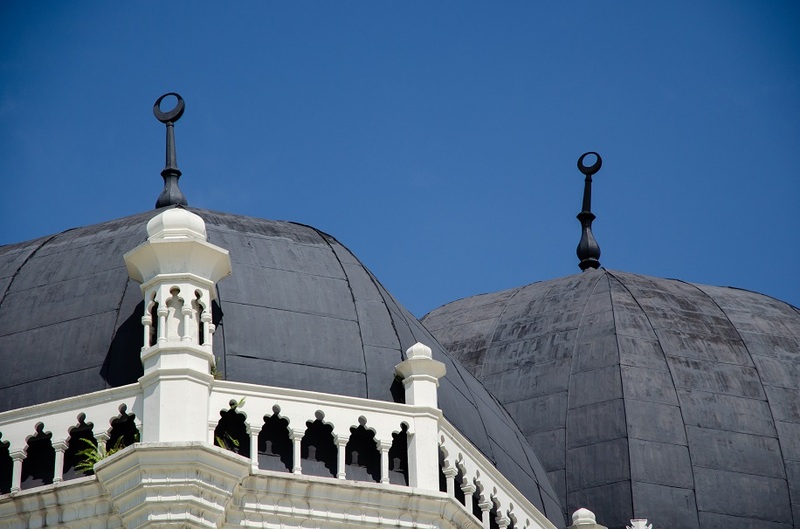 I remember how excited I was to be granted entry (as a non-Muslim) to the national mosque in KL. Thanks for introducing me to Medan. You’re welcome, Caroline. 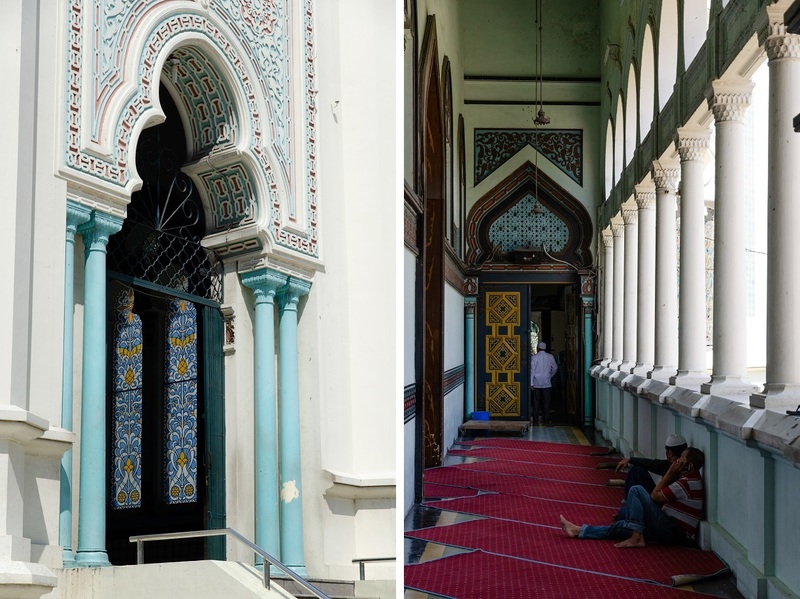 I knew from a previous post of Bama’s that the Grand Mosque in Medan had an eclectic blend of styles from different countries and historical periods, but nothing could have prepared me to see the real thing! And my initial apprehension about going inside was completely unfounded. I’ve not yet been to the national mosque in KL so I’ll have to bookmark that for my next trip there. You have such a wealth of places to visit in Indonesia (and it is such a boon to have a handy translator as a friend and travel mate)! Both the mosque and the palace are impressive, and I commend you guys for giving a city that is unappealing (to many) a chance. I was most interested in reading about the different personality traits. Sometimes I foolishly assume that an entire nation will have similar types of people and behavior patterns even as I know from my own country that a New Yorker and a Georgian are both going to be very different from a Coloradan, for example! You’re completely right, Lex. My understanding and experience of Indonesia is much, much richer because Bama has always volunteered himself as a trusty local insider. I have learned an awful lot from him about culture, languages, regional differences (and stereotypes), and also general etiquette. That has made it easier for me to blend in and Indonesians are often surprised when they learn that I’m actually from abroad! You take great photos of the places you visit. You really inspire me to see more! Thank you for sharing. You’re more than welcome – thanks in turn for the kind words! James I have to say as I was reading your blog post I began thinking that I would see only grey concrete in the photos to come. Then wow to all of the colour and incredible architecture. I do think guidebooks can really give destinations a bad rap to the point they are completely ignored. I enjoyed seeing your discoveries and that rare glimpse of Bama in a photo too. 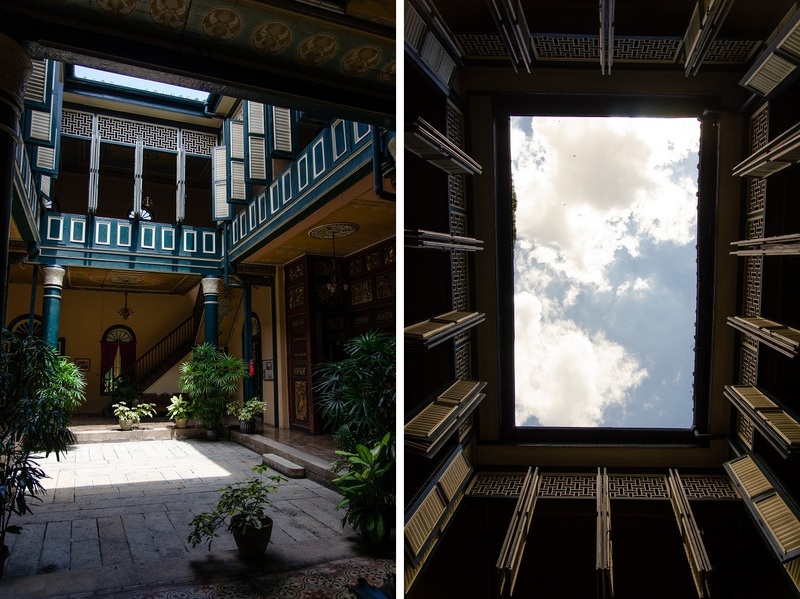 It takes some effort to look beyond Medan’s grime and tough exterior – but once you do there are some wonderful surprises in store. 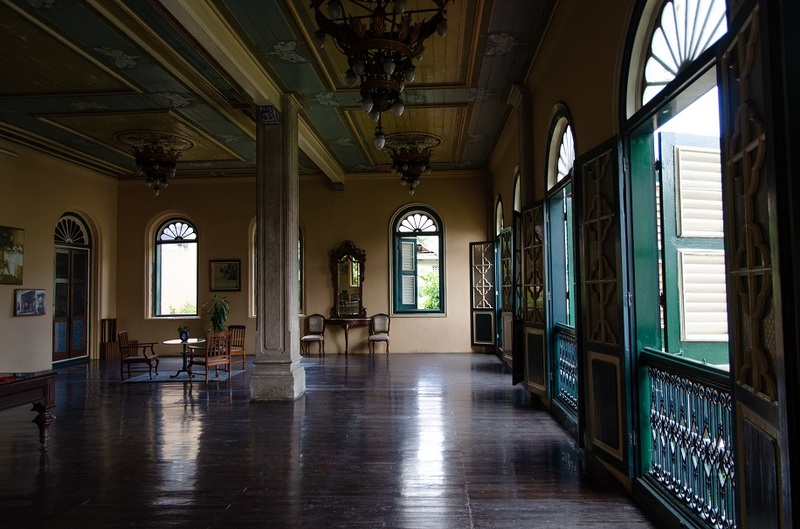 I only hope that the municipal authorities and private sector alike will continue to preserve all the lovely colonial-era buildings that still remain! James, those buildings are amazing! And beautifully captured. Love the eclectic styles and the wonderful colour palettes. Also the historic details. Like Sue above, I was expecting a collection of drab colonial buildings at most. Bama and you should seriously consider compiling a comprehensive online guide to Indonesia. Well, that would be a dream for us! Bama and I still have a long wish list when it comes to historical sites in Indonesia… even on Java alone there are plenty of Hindu-Buddhist ruins that neither of us have been to.